“California’s existing dam and flood infrastructure needs to be fixed now. Oroville Dam gained worldwide attention in February 2017 when crumbling spillways at the nation’s tallest dam triggered one of the largest evacuations in California history. 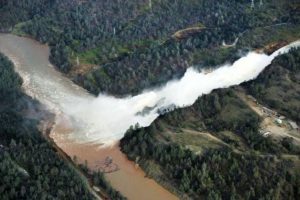 This near catastrophe was a wake-up call to improve the state’s existing dam infrastructure and flood management,” according to a new report released by Friends of the River, the California Sportfishing Protection Alliance, the South Yuba River Citizens League, and American Whitewater. “The Oroville Dam 2017 Spillway Incident: Lessons from the Feather River Basin calls for more action at this and thousands of other high-hazard dams to keep water moving and people safe in the era of super storms and climate chaos. The report makes dozens of recommendations for bringing waterworks into the 21st Century in a comprehensive review of California dams, flood manuals, floodplains, and regulatory delay. “DWR still needs to build a complete emergency spillway at Oroville which would have prevented the near catastrophe. Despite all that’s happened, there is still no plan to build the complete emergency spillway that our groups called for more than twelve years ago. The beneficiaries of the Oroville project have a responsibility to ensure funding and construction of a spillway that will prevent erosion and undercutting of the structure that threatens downstream communities and the Feather River. More details from the report are here.